This article is about the particle. For other uses, see Quark (disambiguation). A quark (/kwɔːrk, kwɑːrk/) is a type of elementary particle and a fundamental constituent of matter. Quarks combine to form composite particles called hadrons, the most stable of which are protons and neutrons, the components of atomic nuclei. Due to a phenomenon known as color confinement, quarks are never directly observed or found in isolation; they can be found only within hadrons, which include baryons (such as protons and neutrons) and mesons. For this reason, much of what is known about quarks has been drawn from observations of hadrons. A proton is composed of two up quarks, one down quark, and the gluons that mediate the forces "binding" them together. The color assignment of individual quarks is arbitrary, but all three colors must be present. Quarks have various intrinsic properties, including electric charge, mass, color charge, and spin. They are the only elementary particles in the Standard Model of particle physics to experience all four fundamental interactions, also known as fundamental forces (electromagnetism, gravitation, strong interaction, and weak interaction), as well as the only known particles whose electric charges are not integer multiples of the elementary charge. There are six types, known as flavors, of quarks: up, down, strange, charm, bottom, and top. Up and down quarks have the lowest masses of all quarks. The heavier quarks rapidly change into up and down quarks through a process of particle decay: the transformation from a higher mass state to a lower mass state. Because of this, up and down quarks are generally stable and the most common in the universe, whereas strange, charm, bottom, and top quarks can only be produced in high energy collisions (such as those involving cosmic rays and in particle accelerators). For every quark flavor there is a corresponding type of antiparticle, known as an antiquark, that differs from the quark only in that some of its properties (such as the electric charge) have equal magnitude but opposite sign. The quark model was independently proposed by physicists Murray Gell-Mann and George Zweig in 1964. Quarks were introduced as parts of an ordering scheme for hadrons, and there was little evidence for their physical existence until deep inelastic scattering experiments at the Stanford Linear Accelerator Center in 1968. Accelerator experiments have provided evidence for all six flavors. The top quark, first observed at Fermilab in 1995, was the last to be discovered. Six of the particles in the Standard Model are quarks (shown in purple). Each of the first three columns forms a generation of matter. for an up antiquark. As with antimatter in general, antiquarks have the same mass, mean lifetime, and spin as their respective quarks, but the electric charge and other charges have the opposite sign. Quarks are spin-​1⁄2 particles, implying that they are fermions according to the spin–statistics theorem. They are subject to the Pauli exclusion principle, which states that no two identical fermions can simultaneously occupy the same quantum state. This is in contrast to bosons (particles with integer spin), of which any number can be in the same state. Unlike leptons, quarks possess color charge, which causes them to engage in the strong interaction. The resulting attraction between different quarks causes the formation of composite particles known as hadrons (see "Strong interaction and color charge" below). ), was conjectured from the beginnings of the quark model but not discovered until the early 21st century. Elementary fermions are grouped into three generations, each comprising two leptons and two quarks. 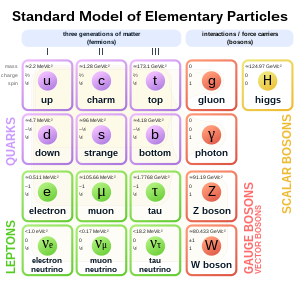 The first generation includes up and down quarks, the second strange and charm quarks, and the third bottom and top quarks. All searches for a fourth generation of quarks and other elementary fermions have failed, and there is strong indirect evidence that no more than three generations exist. [nb 1] Particles in higher generations generally have greater mass and less stability, causing them to decay into lower-generation particles by means of weak interactions. Only first-generation (up and down) quarks occur commonly in nature. Heavier quarks can only be created in high-energy collisions (such as in those involving cosmic rays), and decay quickly; however, they are thought to have been present during the first fractions of a second after the Big Bang, when the universe was in an extremely hot and dense phase (the quark epoch). Studies of heavier quarks are conducted in artificially created conditions, such as in particle accelerators. Having electric charge, mass, color charge, and flavor, quarks are the only known elementary particles that engage in all four fundamental interactions of contemporary physics: electromagnetism, gravitation, strong interaction, and weak interaction. Gravitation is too weak to be relevant to individual particle interactions except at extremes of energy (Planck energy) and distance scales (Planck distance). However, since no successful quantum theory of gravity exists, gravitation is not described by the Standard Model. See the table of properties below for a more complete overview of the six quark flavors' properties. The quark model was independently proposed by physicists Murray Gell-Mann and George Zweig in 1964. 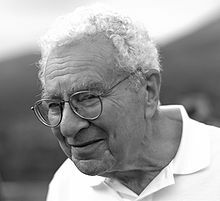 The proposal came shortly after Gell-Mann's 1961 formulation of a particle classification system known as the Eightfold Way—or, in more technical terms, SU(3) flavor symmetry, streamlining its structure. Physicist Yuval Ne'eman had independently developed a scheme similar to the Eightfold Way in the same year. An early attempt at constituent organization was available in the Sakata model. At the time of the quark theory's inception, the "particle zoo" included, amongst other particles, a multitude of hadrons. Gell-Mann and Zweig posited that they were not elementary particles, but were instead composed of combinations of quarks and antiquarks. Their model involved three flavors of quarks, up, down, and strange, to which they ascribed properties such as spin and electric charge. The initial reaction of the physics community to the proposal was mixed. There was particular contention about whether the quark was a physical entity or a mere abstraction used to explain concepts that were not fully understood at the time. In less than a year, extensions to the Gell-Mann–Zweig model were proposed. Sheldon Lee Glashow and James Bjorken predicted the existence of a fourth flavor of quark, which they called charm. The addition was proposed because it allowed for a better description of the weak interaction (the mechanism that allows quarks to decay), equalized the number of known quarks with the number of known leptons, and implied a mass formula that correctly reproduced the masses of the known mesons. In 1968, deep inelastic scattering experiments at the Stanford Linear Accelerator Center (SLAC) showed that the proton contained much smaller, point-like objects and was therefore not an elementary particle. Physicists were reluctant to firmly identify these objects with quarks at the time, instead calling them "partons"—a term coined by Richard Feynman. The objects that were observed at SLAC would later be identified as up and down quarks as the other flavors were discovered. Nevertheless, "parton" remains in use as a collective term for the constituents of hadrons (quarks, antiquarks, and gluons).
) hadrons discovered in cosmic rays in 1947. In a 1970 paper, Glashow, John Iliopoulos and Luciano Maiani presented the so-called GIM mechanism to explain the experimental non-observation of flavor-changing neutral currents. This theoretical model required the existence of the as-yet undiscovered charm quark. The number of supposed quark flavors grew to the current six in 1973, when Makoto Kobayashi and Toshihide Maskawa noted that the experimental observation of CP violation[nb 2] could be explained if there were another pair of quarks. meson. The discovery finally convinced the physics community of the quark model's validity. In the following years a number of suggestions appeared for extending the quark model to six quarks. Of these, the 1975 paper by Haim Harari was the first to coin the terms top and bottom for the additional quarks. In 1977, the bottom quark was observed by a team at Fermilab led by Leon Lederman. This was a strong indicator of the top quark's existence: without the top quark, the bottom quark would have been without a partner. However, it was not until 1995 that the top quark was finally observed, also by the CDF and DØ teams at Fermilab. It had a mass much larger than had been previously expected, almost as large as that of a gold atom. – Three quarks for Muster Mark! In 1963, when I assigned the name "quark" to the fundamental constituents of the nucleon, I had the sound first, without the spelling, which could have been "kwork". Then, in one of my occasional perusals of Finnegans Wake, by James Joyce, I came across the word "quark" in the phrase "Three quarks for Muster Mark". Since "quark" (meaning, for one thing, the cry of the gull) was clearly intended to rhyme with "Mark", as well as "bark" and other such words, I had to find an excuse to pronounce it as "kwork". But the book represents the dream of a publican named Humphrey Chimpden Earwicker. Words in the text are typically drawn from several sources at once, like the "portmanteau" words in Through the Looking-Glass. From time to time, phrases occur in the book that are partially determined by calls for drinks at the bar. I argued, therefore, that perhaps one of the multiple sources of the cry "Three quarks for Muster Mark" might be "Three quarts for Mister Mark", in which case the pronunciation "kwork" would not be totally unjustified. In any case, the number three fitted perfectly the way quarks occur in nature. Zweig preferred the name ace for the particle he had theorized, but Gell-Mann's terminology came to prominence once the quark model had been commonly accepted. The quark flavors were given their names for several reasons. The up and down quarks are named after the up and down components of isospin, which they carry. Strange quarks were given their name because they were discovered to be components of the strange particles discovered in cosmic rays years before the quark model was proposed; these particles were deemed "strange" because they had unusually long lifetimes. Glashow, who co-proposed charm quark with Bjorken, is quoted as saying, "We called our construct the 'charmed quark', for we were fascinated and pleased by the symmetry it brought to the subnuclear world." The names "bottom" and "top", coined by Harari, were chosen because they are "logical partners for up and down quarks". In the past, bottom and top quarks were sometimes referred to as "beauty" and "truth" respectively,[nb 3] but these names have somewhat fallen out of use. While "truth" never did catch on, accelerator complexes devoted to massive production of bottom quarks are sometimes called "beauty factories". Quarks have fractional electric charge values – either (−​1⁄3) or (+​2⁄3) times the elementary charge (e), depending on flavor. Up, charm, and top quarks (collectively referred to as up-type quarks) have a charge of +​2⁄3 e, while down, strange, and bottom quarks (down-type quarks) have −​1⁄3 e. Antiquarks have the opposite charge to their corresponding quarks; up-type antiquarks have charges of −​2⁄3 e and down-type antiquarks have charges of +​1⁄3 e. Since the electric charge of a hadron is the sum of the charges of the constituent quarks, all hadrons have integer charges: the combination of three quarks (baryons), three antiquarks (antibaryons), or a quark and an antiquark (mesons) always results in integer charges. For example, the hadron constituents of atomic nuclei, neutrons and protons, have charges of 0 e and +1 e respectively; the neutron is composed of two down quarks and one up quark, and the proton of two up quarks and one down quark. Spin is an intrinsic property of elementary particles, and its direction is an important degree of freedom. It is sometimes visualized as the rotation of an object around its own axis (hence the name "spin"), though this notion is somewhat misguided at subatomic scales because elementary particles are believed to be point-like. Spin can be represented by a vector whose length is measured in units of the reduced Planck constant ħ (pronounced "h bar"). For quarks, a measurement of the spin vector component along any axis can only yield the values +ħ/2 or −ħ/2; for this reason quarks are classified as spin-​1⁄2 particles. The component of spin along a given axis – by convention the z axis – is often denoted by an up arrow ↑ for the value +​1⁄2 and down arrow ↓ for the value −​1⁄2, placed after the symbol for flavor. For example, an up quark with a spin of +​1⁄2 along the z axis is denoted by u↑. Feynman diagram of beta decay with time flowing upwards. The CKM matrix (discussed below) encodes the probability of this and other quark decays. boson then decays into an electron and an electron antineutrino. Both beta decay and the inverse process of inverse beta decay are routinely used in medical applications such as positron emission tomography (PET) and in experiments involving neutrino detection. The strengths of the weak interactions between the six quarks. The "intensities" of the lines are determined by the elements of the CKM matrix. There exists an equivalent weak interaction matrix for leptons (right side of the W boson on the above beta decay diagram), called the Pontecorvo–Maki–Nakagawa–Sakata matrix (PMNS matrix). Together, the CKM and PMNS matrices describe all flavor transformations, but the links between the two are not yet clear. All types of hadrons have zero total color charge. 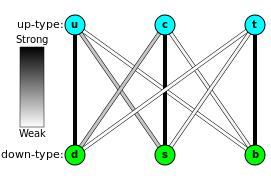 The pattern of strong charges for the three colors of quark, three antiquarks, and eight gluons (with two of zero charge overlapping). According to quantum chromodynamics (QCD), quarks possess a property called color charge. There are three types of color charge, arbitrarily labeled blue, green, and red. [nb 5] Each of them is complemented by an anticolor – antiblue, antigreen, and antired. Every quark carries a color, while every antiquark carries an anticolor. The system of attraction and repulsion between quarks charged with different combinations of the three colors is called strong interaction, which is mediated by force carrying particles known as gluons; this is discussed at length below. The theory that describes strong interactions is called quantum chromodynamics (QCD). A quark, which will have a single color value, can form a bound system with an antiquark carrying the corresponding anticolor. The result of two attracting quarks will be color neutrality: a quark with color charge ξ plus an antiquark with color charge −ξ will result in a color charge of 0 (or "white" color) and the formation of a meson. This is analogous to the additive color model in basic optics. Similarly, the combination of three quarks, each with different color charges, or three antiquarks, each with anticolor charges, will result in the same "white" color charge and the formation of a baryon or antibaryon. In modern particle physics, gauge symmetries – a kind of symmetry group – relate interactions between particles (see gauge theories). Color SU(3) (commonly abbreviated to SU(3)c) is the gauge symmetry that relates the color charge in quarks and is the defining symmetry for quantum chromodynamics. Just as the laws of physics are independent of which directions in space are designated x, y, and z, and remain unchanged if the coordinate axes are rotated to a new orientation, the physics of quantum chromodynamics is independent of which directions in three-dimensional color space are identified as blue, red, and green. SU(3)c color transformations correspond to "rotations" in color space (which, mathematically speaking, is a complex space). Every quark flavor f, each with subtypes fB, fG, fR corresponding to the quark colors, forms a triplet: a three-component quantum field which transforms under the fundamental representation of SU(3)c. The requirement that SU(3)c should be local – that is, that its transformations be allowed to vary with space and time – determines the properties of the strong interaction. In particular, it implies the existence of eight gluon types to act as its force carriers. Two terms are used in referring to a quark's mass: current quark mass refers to the mass of a quark by itself, while constituent quark mass refers to the current quark mass plus the mass of the gluon particle field surrounding the quark. These masses typically have very different values. Most of a hadron's mass comes from the gluons that bind the constituent quarks together, rather than from the quarks themselves. While gluons are inherently massless, they possess energy – more specifically, quantum chromodynamics binding energy (QCBE) – and it is this that contributes so greatly to the overall mass of the hadron (see mass in special relativity). For example, a proton has a mass of approximately 938 MeV/c2, of which the rest mass of its three valence quarks only contributes about 9 MeV/c2; much of the remainder can be attributed to the field energy of the gluons. See Chiral symmetry breaking. The Standard Model posits that elementary particles derive their masses from the Higgs mechanism, which is associated to the Higgs boson. It is hoped that further research into the reasons for the top quark's large mass of ~173 GeV/c2, almost the mass of a gold atom, might reveal more about the origin of the mass of quarks and other elementary particles. 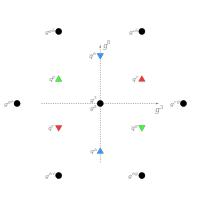 In QCD, quarks are considered to be point-like entities, with zero size. As of 2014, experimental evidence indicates they are no bigger than 10-4 times the size of a proton, i.e. less than 10-19 metres. The following table summarizes the key properties of the six quarks. Flavor quantum numbers (isospin (I3), charm (C), strangeness (S, not to be confused with spin), topness (T), and bottomness (B′)) are assigned to certain quark flavors, and denote qualities of quark-based systems and hadrons. The baryon number (B) is +​1⁄3 for all quarks, as baryons are made of three quarks. For antiquarks, the electric charge (Q) and all flavor quantum numbers (B, I3, C, S, T, and B′) are of opposite sign. Mass and total angular momentum (J; equal to spin for point particles) do not change sign for the antiquarks. J = total angular momentum, B = baryon number, Q = electric charge, I3 = isospin, C = charm, S = strangeness, T = topness, B′ = bottomness. * Notation such as 7005173210000000000♠173210±510 ± 710 denotes two types of measurement uncertainty. In the case of the top quark, the first uncertainty is statistical in nature, and the second is systematic. As described by quantum chromodynamics, the strong interaction between quarks is mediated by gluons, massless vector gauge bosons. Each gluon carries one color charge and one anticolor charge. In the standard framework of particle interactions (part of a more general formulation known as perturbation theory), gluons are constantly exchanged between quarks through a virtual emission and absorption process. When a gluon is transferred between quarks, a color change occurs in both; for example, if a red quark emits a red–antigreen gluon, it becomes green, and if a green quark absorbs a red–antigreen gluon, it becomes red. Therefore, while each quark's color constantly changes, their strong interaction is preserved. Since gluons carry color charge, they themselves are able to emit and absorb other gluons. This causes asymptotic freedom: as quarks come closer to each other, the chromodynamic binding force between them weakens. Conversely, as the distance between quarks increases, the binding force strengthens. The color field becomes stressed, much as an elastic band is stressed when stretched, and more gluons of appropriate color are spontaneously created to strengthen the field. Above a certain energy threshold, pairs of quarks and antiquarks are created. These pairs bind with the quarks being separated, causing new hadrons to form. This phenomenon is known as color confinement: quarks never appear in isolation. This process of hadronization occurs before quarks, formed in a high energy collision, are able to interact in any other way. The only exception is the top quark, which may decay before it hadronizes. s). Sea quarks form when a gluon of the hadron's color field splits; this process also works in reverse in that the annihilation of two sea quarks produces a gluon. The result is a constant flux of gluon splits and creations colloquially known as "the sea". Sea quarks are much less stable than their valence counterparts, and they typically annihilate each other within the interior of the hadron. Despite this, sea quarks can hadronize into baryonic or mesonic particles under certain circumstances. A qualitative rendering of the phase diagram of quark matter. The precise details of the diagram are the subject of ongoing research. Under sufficiently extreme conditions, quarks may become deconfined and exist as free particles. In the course of asymptotic freedom, the strong interaction becomes weaker at higher temperatures. Eventually, color confinement would be lost and an extremely hot plasma of freely moving quarks and gluons would be formed. This theoretical phase of matter is called quark–gluon plasma. The exact conditions needed to give rise to this state are unknown and have been the subject of a great deal of speculation and experimentation. A recent estimate puts the needed temperature at 7012190000000000000♠(1.90±0.02)×1012 kelvin. While a state of entirely free quarks and gluons has never been achieved (despite numerous attempts by CERN in the 1980s and 1990s), recent experiments at the Relativistic Heavy Ion Collider have yielded evidence for liquid-like quark matter exhibiting "nearly perfect" fluid motion. The quark–gluon plasma would be characterized by a great increase in the number of heavier quark pairs in relation to the number of up and down quark pairs. It is believed that in the period prior to 10−6 seconds after the Big Bang (the quark epoch), the universe was filled with quark–gluon plasma, as the temperature was too high for hadrons to be stable. Given sufficiently high baryon densities and relatively low temperatures – possibly comparable to those found in neutron stars – quark matter is expected to degenerate into a Fermi liquid of weakly interacting quarks. This liquid would be characterized by a condensation of colored quark Cooper pairs, thereby breaking the local SU(3)c symmetry. Because quark Cooper pairs harbor color charge, such a phase of quark matter would be color superconductive; that is, color charge would be able to pass through it with no resistance. boson, which constrains the 4th generation neutrino to have a mass greater than ~7001450000000000000♠45 GeV/c2. This would be highly contrasting with the other three generations' neutrinos, whose masses cannot exceed 7000200000000000000♠2 MeV/c2. ^ CP violation is a phenomenon which causes weak interactions to behave differently when left and right are swapped (P symmetry) and particles are replaced with their corresponding antiparticles (C symmetry). ^ "Beauty" and "truth" are contrasted in the last lines of Keats' 1819 poem "Ode on a Grecian Urn", and may have been the origin of those names. ^ The actual probability of decay of one quark to another is a complicated function of (amongst other variables) the decaying quark's mass, the masses of the decay products, and the corresponding element of the CKM matrix. This probability is directly proportional (but not equal) to the magnitude squared (|Vij|2) of the corresponding CKM entry. ^ Despite its name, color charge is not related to the color spectrum of visible light. ^ "Quark (subatomic particle)". Encyclopædia Britannica. Retrieved 2008-06-29. ^ R. Nave. "Confinement of Quarks". HyperPhysics. Georgia State University, Department of Physics and Astronomy. Retrieved 2008-06-29. ^ R. Nave. "Bag Model of Quark Confinement". HyperPhysics. Georgia State University, Department of Physics and Astronomy. Retrieved 2008-06-29. ^ a b R. Nave. "Quarks". HyperPhysics. Georgia State University, Department of Physics and Astronomy. Retrieved 2008-06-29. ^ a b c d B. Carithers; P. Grannis (1995). "Discovery of the Top Quark" (PDF). Beam Line. 25 (3): 4–16. Retrieved 2008-09-23. ^ a b E. D. Bloom; et al. (1969). "High-Energy Inelastic e–p Scattering at 6° and 10°". Physical Review Letters. 23 (16): 930–934. Bibcode:1969PhRvL..23..930B. doi:10.1103/PhysRevLett.23.930. ^ a b M. Breidenbach; et al. (1969). "Observed Behavior of Highly Inelastic Electron–Proton Scattering". Physical Review Letters. 23 (16): 935–939. Bibcode:1969PhRvL..23..935B. doi:10.1103/PhysRevLett.23.935. ^ S. S. M. Wong (1998). Introductory Nuclear Physics (2nd ed.). Wiley Interscience. p. 30. ISBN 978-0-471-23973-4. ^ K. A. Peacock (2008). The Quantum Revolution. Greenwood Publishing Group. p. 125. ISBN 978-0-313-33448-1. ^ B. Povh; C. Scholz; K. Rith; F. Zetsche (2008). Particles and Nuclei. Springer. p. 98. ISBN 978-3-540-79367-0. ^ Section 6.1. in P. C. W. Davies (1979). The Forces of Nature. Cambridge University Press. ISBN 978-0-521-22523-6. ^ a b c M. Munowitz (2005). Knowing. Oxford University Press. p. 35. ISBN 978-0-19-516737-5. ^ W.-M. Yao; et al. (Particle Data Group) (2006). "Review of Particle Physics: Pentaquark Update" (PDF). Journal of Physics G. 33 (1): 1–1232. arXiv:astro-ph/0601168. Bibcode:2006JPhG...33....1Y. doi:10.1088/0954-3899/33/1/001. Ψ′ decays". Physical Review Letters. 100 (14): 142001. arXiv:0708.1790. Bibcode:2008PhRvL.100n2001C. doi:10.1103/PhysRevLett.100.142001. PMID 18518023. ^ "Belle Discovers a New Type of Meson" (Press release). KEK. 2007. Archived from the original on 2009-01-22. Retrieved 2009-06-20. ^ R. Aaij; et al. (LHCb collaboration) (2014). "Observation of the Resonant Character of the Z(4430)− State". Physical Review Letters. 112 (22): 222002. arXiv:1404.1903. Bibcode:2014PhRvL.112v2002A. doi:10.1103/PhysRevLett.112.222002. PMID 24949760. ^ C. Amsler; et al. (Particle Data Group) (2008). "Review of Particle Physics: b′ (4th Generation) Quarks, Searches for" (PDF). Physics Letters B. 667 (1): 1–1340. Bibcode:2008PhLB..667....1A. doi:10.1016/j.physletb.2008.07.018. ^ C. Amsler; et al. (Particle Data Group) (2008). "Review of Particle Physics: t′ (4th Generation) Quarks, Searches for" (PDF). Physics Letters B. 667 (1): 1–1340. Bibcode:2008PhLB..667....1A. doi:10.1016/j.physletb.2008.07.018. ^ D. Decamp; et al. (ALEPH Collaboration) (1989). "Determination of the Number of Light Neutrino Species" (PDF). Physics Letters B. 231 (4): 519. Bibcode:1989PhLB..231..519D. doi:10.1016/0370-2693(89)90704-1. ^ A. Fisher (1991). "Searching for the Beginning of Time: Cosmic Connection". Popular Science. 238 (4): 70. ^ J. D. Barrow (1997) . "The Singularity and Other Problems". The Origin of the Universe (Reprint ed.). Basic Books. ISBN 978-0-465-05314-8. ^ D. H. Perkins (2003). Particle Astrophysics. Oxford University Press. p. 4. ISBN 978-0-19-850952-3. ^ a b M. Gell-Mann (1964). "A Schematic Model of Baryons and Mesons". Physics Letters. 8 (3): 214–215. Bibcode:1964PhL.....8..214G. doi:10.1016/S0031-9163(64)92001-3. ^ a b G. Zweig (1964). "An SU(3) Model for Strong Interaction Symmetry and its Breaking" (PDF). CERN Report No.8182/TH.401. ^ a b G. Zweig (1964). "An SU(3) Model for Strong Interaction Symmetry and its Breaking: II". CERN Report No.8419/TH.412. ^ M. Gell-Mann (2000) . "The Eightfold Way: A Theory of Strong Interaction Symmetry". In M. Gell-Mann, Y. Ne'eman. The Eightfold Way. Westview Press. p. 11. ISBN 978-0-7382-0299-0. Original: M. Gell-Mann (1961). "The Eightfold Way: A Theory of Strong Interaction Symmetry". Synchrotron Laboratory Report CTSL-20. California Institute of Technology. doi:10.2172/4008239. ^ Y. Ne'eman (2000) . "Derivation of Strong Interactions from Gauge Invariance". In M. Gell-Mann, Y. Ne'eman. The Eightfold Way. Westview Press. ISBN 978-0-7382-0299-0. ^ R. C. Olby; G. N. Cantor (1996). Companion to the History of Modern Science. Taylor & Francis. p. 673. ISBN 978-0-415-14578-7. ^ A. Pickering (1984). Constructing Quarks. University of Chicago Press. pp. 114–125. ISBN 978-0-226-66799-7. ^ B. J. Bjorken; S. L. Glashow (1964). "Elementary Particles and SU(4)". Physics Letters. 11 (3): 255–257. Bibcode:1964PhL....11..255B. doi:10.1016/0031-9163(64)90433-0. ^ J. I. Friedman. "The Road to the Nobel Prize". Huế University. Archived from the original on 2008-12-25. Retrieved 2008-09-29. ^ R. P. Feynman (1969). "Very High-Energy Collisions of Hadrons" (PDF). Physical Review Letters. 23 (24): 1415–1417. Bibcode:1969PhRvL..23.1415F. doi:10.1103/PhysRevLett.23.1415. ^ S. Kretzer; H. L. Lai; F. I. Olness; W. K. Tung (2004). "CTEQ6 Parton Distributions with Heavy Quark Mass Effects". Physical Review D. 69 (11): 114005. arXiv:hep-ph/0307022. Bibcode:2004PhRvD..69k4005K. doi:10.1103/PhysRevD.69.114005. ^ a b D. J. Griffiths (1987). Introduction to Elementary Particles. John Wiley & Sons. p. 42. ISBN 978-0-471-60386-3. ^ M. E. Peskin; D. V. Schroeder (1995). An Introduction to Quantum Field Theory. Addison–Wesley. p. 556. ISBN 978-0-201-50397-5. ^ V. V. Ezhela (1996). Particle Physics. Springer. p. 2. ISBN 978-1-56396-642-2. ^ S. L. Glashow; J. Iliopoulos; L. Maiani (1970). "Weak Interactions with Lepton–Hadron Symmetry". Physical Review D. 2 (7): 1285–1292. Bibcode:1970PhRvD...2.1285G. doi:10.1103/PhysRevD.2.1285. ^ D. J. Griffiths (1987). Introduction to Elementary Particles. John Wiley & Sons. p. 44. ISBN 978-0-471-60386-3. ^ M. Kobayashi; T. Maskawa (1973). "CP-Violation in the Renormalizable Theory of Weak Interaction". Progress of Theoretical Physics. 49 (2): 652–657. Bibcode:1973PThPh..49..652K. doi:10.1143/PTP.49.652. hdl:2433/66179. Archived from the original on 2008-12-24. ^ a b H. Harari (1975). "A New Quark Model for hadrons". Physics Letters B. 57 (3): 265. Bibcode:1975PhLB...57..265H. doi:10.1016/0370-2693(75)90072-6. ^ a b K. W. Staley (2004). The Evidence for the Top Quark. Cambridge University Press. pp. 31–33. ISBN 978-0-521-82710-2. ^ S. W. Herb; et al. (1977). "Observation of a Dimuon Resonance at 9.5 GeV in 400-GeV Proton-Nucleus Collisions". Physical Review Letters. 39 (5): 252. Bibcode:1977PhRvL..39..252H. doi:10.1103/PhysRevLett.39.252. ^ M. Bartusiak (1994). A Positron named Priscilla. National Academies Press. p. 245. ISBN 978-0-309-04893-4. Collisions with the Collider Detector at Fermilab". Physical Review Letters. 74 (14): 2626–2631. arXiv:hep-ex/9503002. Bibcode:1995PhRvL..74.2626A. doi:10.1103/PhysRevLett.74.2626. PMID 10057978. Collisions at √s = 1.8 TeV". Physical Review Letters. 74 (13): 2422–2426. arXiv:hep-ex/9411001. Bibcode:1995PhRvL..74.2422A. doi:10.1103/PhysRevLett.74.2422. PMID 10057924. ^ K. W. Staley (2004). The Evidence for the Top Quark. Cambridge University Press. p. 144. ISBN 978-0-521-82710-2. ^ "New Precision Measurement of Top Quark Mass". Brookhaven National Laboratory News. 2004. Retrieved 2013-11-03. ^ J. Joyce (1982) . Finnegans Wake. Penguin Books. p. 383. ISBN 978-0-14-006286-1. ^ S. Pronk-Tiethoff (2013). The Germanic loanwords in Proto-Slavic. Rodopi. p. 71. ISBN 978-9401209847. ^ "What Does 'Quark' Have to Do with Finnegans Wake?". Merriam-Webster. Retrieved 2018-01-17. ^ G. E. P. Gillespie. "Why Joyce Is and Is Not Responsible for the Quark in Contemporary Physics" (PDF). Papers on Joyce 16. Retrieved 2018-01-17. ^ M. Gell-Mann (1995). The Quark and the Jaguar: Adventures in the Simple and the Complex. Henry Holt and Co. p. 180. ISBN 978-0-8050-7253-2. ^ J. Gleick (1992). Genius: Richard Feynman and Modern Physics. Little Brown and Company. p. 390. ISBN 978-0-316-90316-5. ^ J. J. Sakurai (1994). S. F. Tuan, ed. Modern Quantum Mechanics (Revised ed.). Addison–Wesley. p. 376. ISBN 978-0-201-53929-5. ^ a b D. H. Perkins (2000). Introduction to High Energy Physics. Cambridge University Press. p. 8. ISBN 978-0-521-62196-0. ^ M. Riordan (1987). The Hunting of the Quark: A True Story of Modern Physics. Simon & Schuster. p. 210. ISBN 978-0-671-50466-3. ^ Rolnick, William B. (31 May 2003). Remnants Of The Fall: Revelations Of Particle Secrets. World Scientific Pub Co Inc. p. 136. ISBN 978-9812380609. Retrieved 14 October 2018. ^ Mee, Nicholas (24 August 2012). Higgs Force: Cosmic Symmetry Shattered. Quantum Wave Publishing. ISBN 978-0957274617. Retrieved 14 October 2018. ^ Gooden, Philip (3 November 2016). May We Borrow Your Language? : How English Steals Words From All Over the World. Head of Zeus. ISBN 978-1784977986. Retrieved 14 October 2018. ^ F. Close (2006). The New Cosmic Onion. CRC Press. p. 133. ISBN 978-1-58488-798-0. ^ J. T. Volk; et al. (1987). "Letter of Intent for a Tevatron Beauty Factory" (PDF). Fermilab Proposal #783. ^ C. Quigg (2006). "Particles and the Standard Model". In G. Fraser. The New Physics for the Twenty-First Century. Cambridge University Press. p. 91. ISBN 978-0-521-81600-7. ^ "The Standard Model of Particle Physics". BBC. 2002. Retrieved 2009-04-19. ^ F. Close (2006). The New Cosmic Onion. CRC Press. pp. 80–90. ISBN 978-1-58488-798-0. ^ D. Lincoln (2004). Understanding the Universe. World Scientific. p. 116. ISBN 978-981-238-705-9. ^ "Weak Interactions". Virtual Visitor Center. Stanford Linear Accelerator Center. 2008. Retrieved 2008-09-28. ^ K. Nakamura; et al. (Particle Data Group) (2010). "Review of Particles Physics: The CKM Quark-Mixing Matrix" (PDF). Journal of Physics G. 37 (7A): 075021. Bibcode:2010JPhG...37g5021N. doi:10.1088/0954-3899/37/7A/075021. ^ Z. Maki; M. Nakagawa; S. Sakata (1962). "Remarks on the Unified Model of Elementary Particles". Progress of Theoretical Physics. 28 (5): 870. Bibcode:1962PThPh..28..870M. doi:10.1143/PTP.28.870. −2°". European Physical Journal. C50 (3): 573–578. arXiv:hep-ph/0605032. Bibcode:2007EPJC...50..573C. doi:10.1140/epjc/s10052-007-0212-z. ^ R. Nave. "The Color Force". HyperPhysics. Georgia State University, Department of Physics and Astronomy. Retrieved 2009-04-26. ^ B. A. Schumm (2004). Deep Down Things. Johns Hopkins University Press. pp. 131–132. ISBN 978-0-8018-7971-5. ^ a b Part III of M. E. Peskin; D. V. Schroeder (1995). An Introduction to Quantum Field Theory. Addison–Wesley. ISBN 978-0-201-50397-5. ^ V. Icke (1995). The Force of Symmetry. Cambridge University Press. p. 216. ISBN 978-0-521-45591-6. ^ M. Y. Han (2004). A Story of Light. World Scientific. p. 78. ISBN 978-981-256-034-6. ^ C. Sutton. "Quantum Chromodynamics (physics)". Encyclopædia Britannica Online. Retrieved 2009-05-12. ^ A. Watson (2004). The Quantum Quark. Cambridge University Press. pp. 285–286. ISBN 978-0-521-82907-6. ^ a b c K. A. Olive; et al. (Particle Data Group) (2014). "Review of Particle Physics". Chinese Physics C. 38 (9): 090001. Bibcode:2014ChPhC..38i0001O. doi:10.1088/1674-1137/38/9/090001. ^ W. Weise; A. M. Green (1984). Quarks and Nuclei. World Scientific. pp. 65–66. ISBN 978-9971-966-61-4. ^ D. McMahon (2008). Quantum Field Theory Demystified. McGraw–Hill. p. 17. ISBN 978-0-07-154382-8. ^ S. G. Roth (2007). Precision Electroweak Physics at Electron–Positron Colliders. Springer. p. VI. ISBN 978-3-540-35164-1. ^ R. P. Feynman (1985). QED: The Strange Theory of Light and Matter (1st ed.). Princeton University Press. pp. 136–137. ISBN 978-0-691-08388-9. ^ M. Veltman (2003). Facts and Mysteries in Elementary Particle Physics. World Scientific. pp. 45–47. ISBN 978-981-238-149-1. ^ F. Wilczek; B. Devine (2006). Fantastic Realities. World Scientific. p. 85. ISBN 978-981-256-649-2. ^ F. Wilczek; B. Devine (2006). Fantastic Realities. World Scientific. pp. 400ff. ISBN 978-981-256-649-2. ^ M. Veltman (2003). Facts and Mysteries in Elementary Particle Physics. World Scientific. pp. 295–297. ISBN 978-981-238-149-1. ^ T. Yulsman (2002). Origin. CRC Press. p. 55. ISBN 978-0-7503-0765-9. ^ F. Garberson (2008). "Top Quark Mass and Cross Section Results from the Tevatron". arXiv:0808.0273 [hep-ex]. ^ J. Steinberger (2005). Learning about Particles. Springer. p. 130. ISBN 978-3-540-21329-1. ^ C.-Y. Wong (1994). Introduction to High-energy Heavy-ion Collisions. World Scientific. p. 149. ISBN 978-981-02-0263-7. ^ S. B. Rüester; V. Werth; M. Buballa; I. A. Shovkovy; D. H. Rischke (2005). "The Phase Diagram of Neutral Quark Natter: Self-consistent Treatment of Quark Masses". Physical Review D. 72 (3): 034003. arXiv:hep-ph/0503184. Bibcode:2005PhRvD..72c4004R. doi:10.1103/PhysRevD.72.034004. ^ M. G. Alford; K. Rajagopal; T. Schaefer; A. Schmitt (2008). "Color Superconductivity in Dense Quark Matter". Reviews of Modern Physics. 80 (4): 1455–1515. arXiv:0709.4635. Bibcode:2008RvMP...80.1455A. doi:10.1103/RevModPhys.80.1455. ^ S. Mrowczynski (1998). "Quark–Gluon Plasma". Acta Physica Polonica B. 29 (12): 3711. arXiv:nucl-th/9905005. Bibcode:1998AcPPB..29.3711M. ^ Z. Fodor; S. D. Katz (2004). "Critical Point of QCD at Finite T and μ, Lattice Results for Physical Quark Masses". Journal of High Energy Physics. 2004 (4): 50. arXiv:hep-lat/0402006. Bibcode:2004JHEP...04..050F. doi:10.1088/1126-6708/2004/04/050. ^ U. Heinz; M. Jacob (2000). "Evidence for a New State of Matter: An Assessment of the Results from the CERN Lead Beam Programme". arXiv:nucl-th/0002042. ^ "RHIC Scientists Serve Up "Perfect" Liquid". Brookhaven National Laboratory. 2005. Archived from the original on 2013-04-15. Retrieved 2009-05-22. ^ T. Yulsman (2002). Origins: The Quest for Our Cosmic Roots. CRC Press. p. 75. ISBN 978-0-7503-0765-9. ^ A. Sedrakian; J. W. Clark; M. G. Alford (2007). Pairing in Fermionic Systems. World Scientific. pp. 2–3. ISBN 978-981-256-907-3. 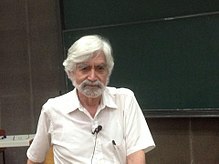 A. Ali; G. Kramer (2011). "JETS and QCD: A Historical Review of the Discovery of the Quark and Gluon Jets and Its Impact on QCD". European Physical Journal H. 36 (2): 245. arXiv:1012.2288. Bibcode:2011EPJH...36..245A. doi:10.1140/epjh/e2011-10047-1. R. Bowley; E. Copeland. "Quarks". Sixty Symbols. Brady Haran for the University of Nottingham. D. J. Griffiths (2008). Introduction to Elementary Particles (2nd ed.). Wiley–VCH. ISBN 978-3-527-40601-2. I. S. Hughes (1985). Elementary Particles (2nd ed.). Cambridge University Press. ISBN 978-0-521-26092-3. R. Oerter (2005). The Theory of Almost Everything: The Standard Model, the Unsung Triumph of Modern Physics. Pi Press. ISBN 978-0-13-236678-6. A. Pickering (1984). Constructing Quarks: A Sociological History of Particle Physics. The University of Chicago Press. ISBN 978-0-226-66799-7. B. Povh (1995). Particles and Nuclei: An Introduction to the Physical Concepts. Springer-Verlag. ISBN 978-0-387-59439-2. M. Riordan (1987). The Hunting of the Quark: A True Story of Modern Physics. Simon & Schuster. ISBN 978-0-671-64884-8. B. A. Schumm (2004). Deep Down Things: The Breathtaking Beauty of Particle Physics. Johns Hopkins University Press. ISBN 978-0-8018-7971-5. Wikimedia Commons has media related to Quark. Look up quark in Wiktionary, the free dictionary. The Top Quark And The Higgs Particle by T.A. Heppenheimer – A description of CERN's experiment to count the families of quarks.